With a Pro account you can easily import pre-collected or constructed social network data. This guide demonstrates step by step how to set up your data in order for you to visualize and analyze it using Socilyzer. Navigate to "Adv. Data" in the top and continue to the data editor. You are now presented with the settings for your project and the different ways to import your data. Groups -if you have assigned people to groups, this is where to enter the number of groups - otherwise just enter "1". People -this is the number of unique nodes in your data set. Scenes -if you have multiple data sets for the same nodes, you can enter them as new scenes - otherwise just enter "1". You then have the choice between entering node data manually or importing the attributes from an Excel file. Like with the nodes, you have the choice between manual entry and importing data from an Excel file. After the following first step the same network is set up twice: once using the manual settings and once using the Excel files. The methods can however be combined for your run, if needed. First, the groups need to be set up. This step is common to both runs. Here each group is marked by a number, a name and a color. They are are here to divide the nodes into groups such as departments, geographical location etc. and they are used in the visualization (colored nodes) and analysis. You also have to enter scene and option details manually. Scene name is like a description for the relationship types and option names indicate the intensity of the relationship. The options range from 0 to 5. The option with the id 0 indicates a no relationship option and is the default for the survey. From 1 to 5 the insitity is increasing, e.g., from "Seldom" to "Often". Just like the groups were set up, you will now set up the nodes. 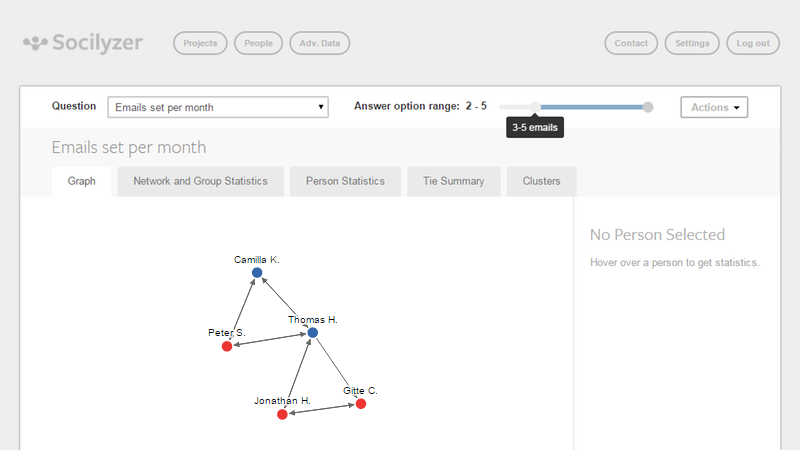 Each node is set up with a predetermined id, a name and then assigned to a group. This method can be fairly time-consuming if you have more than ten nodes. Manual entry of the ties is done in the matrix shown further down. Rows indicate raters (tie origin) and columns those rated (tie destination). Both rows and columns list the node ids from above. The system expects an integer between 0 and 5 in each cell. In our simple example with just 5 nodes there are 25 cells to fill, so you might want to set it up in Excel first. 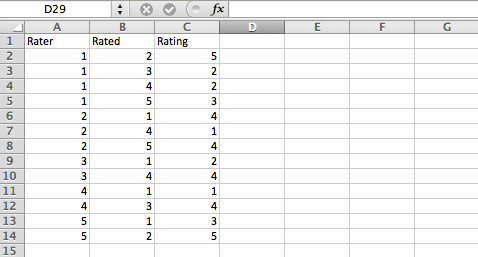 If you have a matrix in Excel you can copy all the ratings and paste the into the first cell. This will populate all the cells for you. This copy-paste method is demonstrated below. In case you have binary ties (tie / no-tie), you might want to set up the ties with the rating "5" as our system per default shows these ties first. To avoid that errors are raised and ensure that the data is imported correctly the Excel templates (linked to below) should be used. These templates should not be changed in terms of file format (.xslx) and headlines - as the system only expects to receive the data outlined the templates. Download the Excel file with node attributes here and open it in Excel. In the first column you indicate the id for each node - always increasing the id by 1. The second column lists the names. Only use Latin characters when you enter the names avoid special characters as the file encoding of these tends to stop the import process. In the third and final column you list which group each node belongs to. Note: you should only enter the group ids - not the group names - as the groups are set up during the last stage of the data import along with node colors. Ties are also called edges, so an edge list is simply a list of ties within a network. Like with the attributes file you need to download the template file. As shown below the first column holds the rater's id (tie origin), the second column the rated's id (tie destination) and the third column shows the intensity of their relationship. When the list is complete it is saved as described earlier and uploaded to the data editor. In case you have boolean ties (tie / no-tie), you might want to set up the ties with the rating "5" as our system per default shows these ties first. See further down how ties stored as matrices can be converted to edge lists. The network from above is illustrated below. Here all ties that indicate more than three monthly emails are visualized. Operate the range selector in the top right to define which ties to analyze. Most of the errors you can get will also tell you how to correct, however, the most common error will only show a generic error message. 9 out of 10 times the problem is an Excel file has a foreign (non-Latin) character or the file was not saved as instructed earlier. Correcting this will solve the problem and the analysis will run as it should. Edge lists are forced when you have more than 30 nodes because the matrix would be too big for most screens. Fortunately, it is easy to convert a matrix into an edge list with a macro for Excel. Adam Davis' post (and further explained by Michael La Voie's comment below) shows you exactly how to do - in addition to this you might want to delete all the 0-ratings as they only slow down the import process.